The OpenHardwareExG is a platform for ECG, EEG, EMG, ENG, EOG, and evoked potential applications. 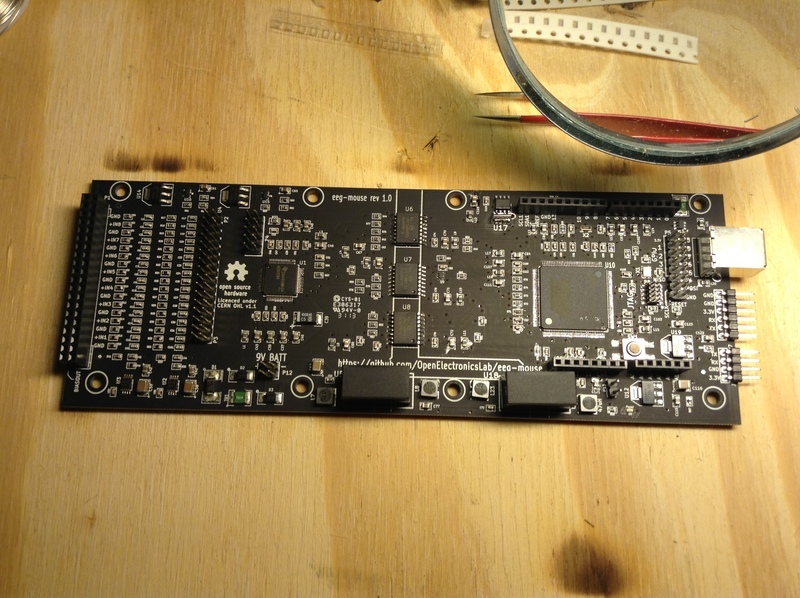 The OpenHardwareExG platform was originally developed as part of the eeg-mouse project. Hardware and software that we develop will have a free/open source license. We also prefer to use hardware and software that are free/open source. For us, this is a hobby and learning project. It's important to keep it fun, and take the time to learn along the way. 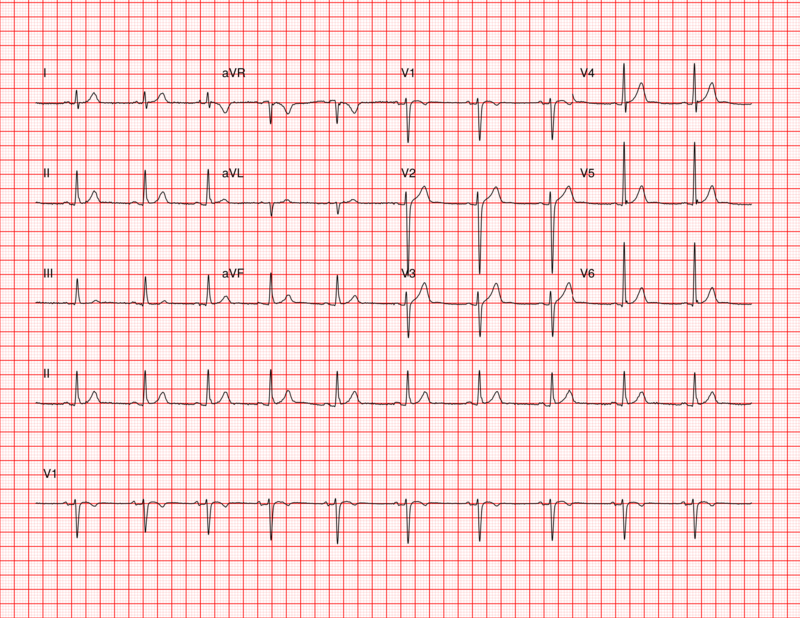 For this recording, the IN1N electrode was position on the right shoulder, the IN1P electrode on the left shoulder, and the BIAS OUT was on the right hip (lead II of a standard ECG). The graphing software used is OpenElectronicsLab's fork of GDAQRec. We can also record a full 12-lead ECG. This example was recorded with IN1P-IN8P connected to electrodes at RA, LA, and V1-V6 respectively, IN1N (tied to IN2N-IN8N) connected to LL, and BIAS_OUT connected to RL. We then used this R script to do the appropriate processing and plotting to generate the conventional plot of 12 leads on the standardized grid. The big changes in signals are from the eye muscles opening, closing, and blinking. When the eyes are closed, you can see what appears to be an increase in alpha waves, particularly on channels 3 and 4 (positioned over the occipital lobes in this recording). For this recording, the IN1N electode was positioned at FPz, the BIAS OUT electrode positioned over the spinous process of C5, and the positive electrodes at Fp1, Fp2, O1, O2, F7, F8, T3, and T4 (using the 10-20 system). The Rev1 design integrates an Arduino Due compatible microcontroller, 5kV of reinforced isolation (for safety), and an ADS1299 analog front end for capturing EEG signals. We use standard disposable EEG electrodes (both single use self-adhesive electrodes and non-adhesive electrodes that can be used multiple times). patch-shield-digital: LEDs for lead-off detection display and signal in use. Also provides physical support for the touch proof connector sockets. firmware for the Arduino: Initializes the ADS chip and sends the signals from the chip to the computer via the USB port, in frames and in hex format. 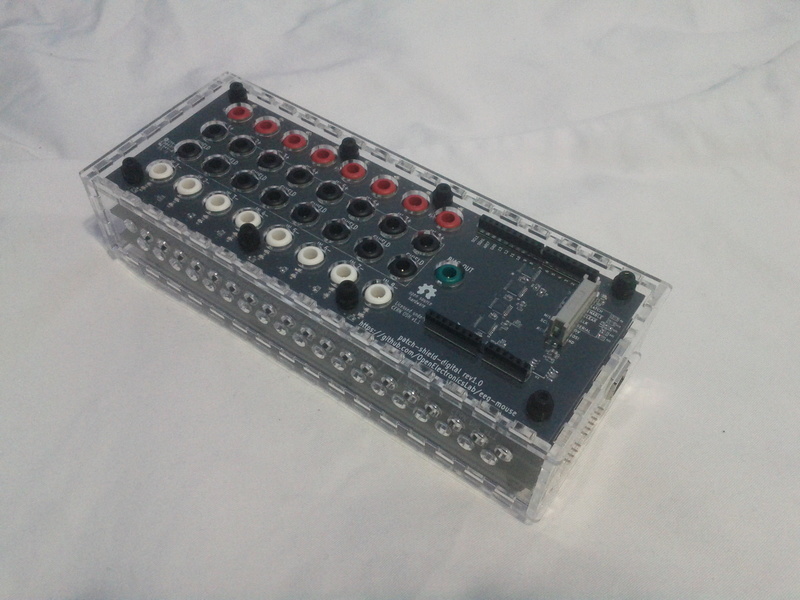 serial-reader.pl: Reads the data from the Arduino, outputs the raw hex frames to standard out. frame-parser.pl: Reads the raw hex frames and converts them to comma delimited output. The format of the output is: the letter 'C' (magic), lead-off status Positive, lead-off status Negative, status GPIO1 to GPIO4, signal from channels 1 to 8 in volts. (This applies mostly to the kicad-files and scad-files directories) "Documentation" means schematic diagrams, designs, circuit or circuit board layouts, mechanical drawings, flow charts and descriptive text, and other explanatory material that is explicitly stated as being made available under the conditions of this Licence. The Documentation may be in any medium, including but not limited to computer files and representations on paper, film, or any other media.